Your run-of-the-mill stereo headphones do a pretty good job of imitating audio directionality—you know if Kanye is yelling in your left ear—but 3D Sound Labs’ new Neoh headphones do an even better job. That’s because these “smart 3D audio headphones,” which debuted Sunday at CES, incorporate head-tracking sensors that measure your head’s position in space. Put on these phones and you can physically turn around and force Kanye to yell into your right ear. 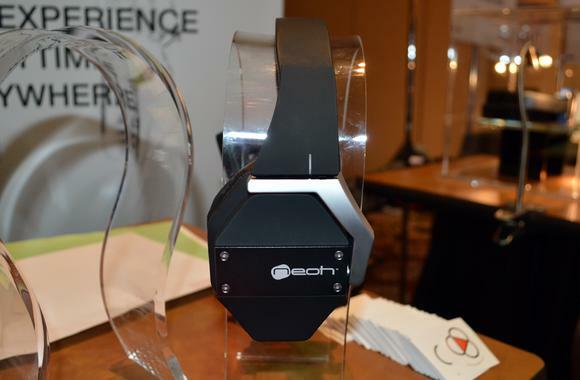 The Neohs look like typical over-ear headphones: Black, a little clunky, with angled edges and an industrial vibe. They’re wired, but the head-tracking sensors use Bluetooth, so to get the full experience you’ll need to plug and pair (similar to Alpine’s phones, but with different functionality). The head-tracking sensor is the only real tech on the headphones themselves; the audio processing all takes place on your device through an app. To get the 3D sound effect, you’ll need to play media through the app (currently iOS only, but Android, PC, and Mac versions are in development). I tried the Neohs on, and I can tell you they do work as described. 3D Sound Labs’ co-founder Dmitri Singer says they’re like “Oculus Rift, but for your ears,” and that’s a pretty good description. The effect is similar to standing in the middle of a multi-speaker setup (with speakers in front of you and behind you). In the demo, I watched a clip from the movie Gravity, and was able to turn my head and hear the sound change. I heard George Clooney speak on my right; I turned my head “away” from him and it sounded like he was behind me. That said, it didn’t exactly sound as though George was in the room with me—instead it sounded like I was watching him on a TV and then I turned away from the TV to do the dishes. The Neohs will ship this spring and will be priced less than $299.